Dr. Reuben Abraham is CEO and Senior Fellow at IDFC Institute, a think/do tank set up by India’s largest infrastructure finance company. He is also on IDFC Institute’s Executive Council. IDFC Institute’s focus is on the political, economic, and spatial causes and consequences of, and obstacles to, India’s ongoing transformation from a low income, state led economy to a market based democracy, a journey many emerging markets share. He is also a non-resident scholar at the Urbanization Project at New York University’s Stern School of Business. Before IDFC, he was on the Faculty and Executive Director of the Centre for Emerging Markets Solutions (CEMS) at the Indian School of Business (ISB), where he continues to serve on the Next Generation Leaders Board of the school. 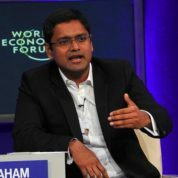 Dr. Abraham was a Legatum Global Fellow for 2013; in 2012, he was named to Wired Magazine’s “Smart List 2012: 50 people who will change the world.” He was selected as a Young Global Leader for 2009 by the World Economic Forum, where he serves on the Global Agenda Council on Emerging Multinationals. He is a member of the international advisory board of Unicredit Bank of Italy; the board of the Centre for Civil Society, India’s leading classical liberal think tank; and THNK, The Amsterdam School of Creative Leadership. He is an independent director of the Soros Economic Development Fund (SEDF), a fund that makes catalytic investments across emerging markets. Under the aegis of SEDF, he helped set up SONG, a unique India-focused early stage SME venture fund with Google and Omidyar Network as co-investors. A TED Global Fellow in 2007, he now sits on the TED Fellows Advisory Board. He is also on the board of First Home Realty Solutions, which builds low-income housing across India; RenewGen, a waste-to-energy company; and the DLF Foundation. He completed his M.A., M.Phil and Ph.D. from Columbia University. During his time at Columbia, he was an Associate Fellow in Global Economics at the Council on Foreign Relations, a Fellow of the Public Policy Consortium and a Sloan Foundation/CITI Telecommunications Fellow.